How redundant is the title of this blog post? Yet, every year around this time I get a magical feeling bringing me back to my childhood home and the memories that flood back to me when I remember the years that have gone by. I am truly thankful for Thanksgiving. It reminds me to be thankful. It reminds me how blessed I am. It reminds me that no matter what happens, I have lived a wonderful life, even at the age of 32. I am so young, but have been blessed with so many wonderful memories and significant moments in my life. Stop…Just for a minute, let your memories flood in. Some of them are painful. Some of them are awesome! I am truly thankful! I started thinking about his concept last night. 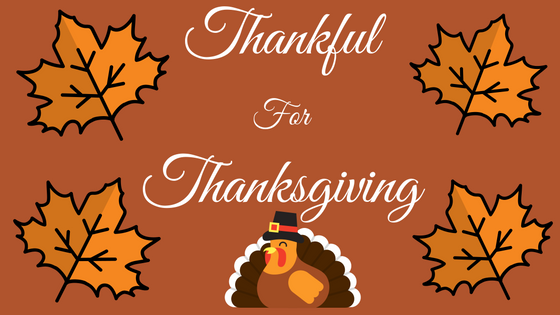 The title just flashed before my eyes, “Thankful for thankfulness.” That was the original title I thought of, but the more I pondered Thanksgiving and gratitude, I changed the title. However, I think it is important for people to be thankful for the ability to be thankful. It means that we have something to be thankful for. We have been blessed. It’s funny how this topic has emerged for me. This past year I have started implanting a coping skill with some of my clients were I asked them to write 5 things they are thankful for each day. I started implementing this activity months ago. There is much research on the benefits of gratitude. Harvard produced an article describing the research done by Dr. Robert A. Emmons of the University of California, Davis, and Dr. Michael E. McCullough of the University of Miami and ways to cultivate gratitude. My pastor on Sunday discussed being thankful. He could hardly preach about it at first and described his thoughts about preaching a Thanksgiving sermon as being a cliché. However, to the amazement of our church. The more he delved into his sermon, the more enthusiastic he became and the more his infectious attitude drew us in and opened us to an overall attitude of gratitude. I too believe writing a blog about gratitude during the week of Thanksgiving seems to be a cliché, but I keep reminding myself that this is life. Life has so much meaning and the holidays we celebrate are to continually remind us of the blessings and what to be thankful for. Thus, the memories bring the feels. I am listening to Christmas music as I write this post. My stomach has butterflies. My emotions are soaring. I can’t help it! It’s a magical time. The question can be considered, if we did not have Thanksgiving, would we remember to be thankful? If we did not have this time of year, what would our nation be like? And so, I implore you, remember the good times. Be blessed. Love your family and your neighbors. Spread the Christmas spirit. Talk about the important things in life. Let Jesus live through you this holiday season. And finally, let us not only be thankful now, but be thankful always. When we find that everything seems out of our control, being thankful is one thing we can control.